Can you fix that? The story of our mainsail failure and repair. Are laminated are sails suitable for offshore cruising and can a membrane/fiberpath type sail be repaired? This is a story of the failure and resurrection of our mainsail who we call Thomas Coville. 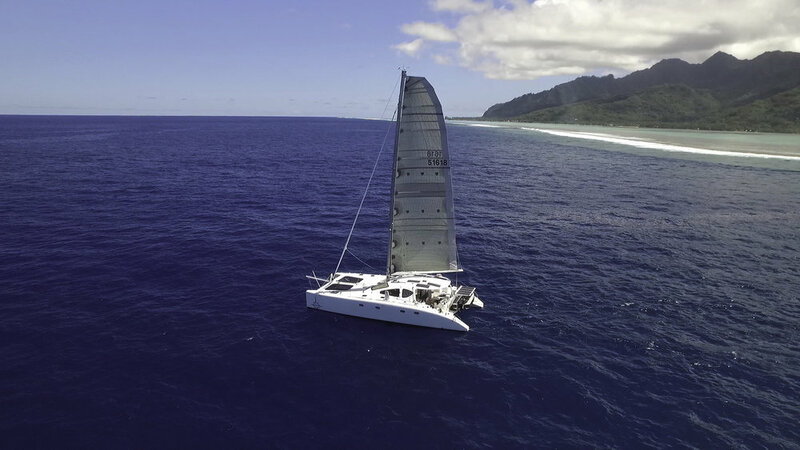 We have told the story of ROAM from the start of the build via diy-yachts.com and through the Multihull World Magazine. After launch we have documented our travels via the social channels and connected with others in the sailing and adventure travel community. As a result, we are regularly approached by other boat builders and people running similar boats with questions about how certain products or gear is going or where we sourced it from. In turn we keep an ear out for people having good experiences with gear and compare it to how ours is doing. Its all part of the cruising community sharing information and helping each other out with the goal of getting the best value and reliability form our equipment. During the build of ROAM I found sail selection equal with paint systems in regard to being the toughest decision to make. They are huge dollar decisions, making them stressful and ones you will have to live with for years. It also seems, when it comes to sails, as with paint, everyone has a strong opinion of what they consider to be the “best” choice. Ask the next person and they will have an equally strong, but totally contradicting advice… Finding someone with a broad range of experience with the products your choosing between is tough. Add in overseas cheap options and you have a lot of paths to choose from. We tried to capture some of the decisions we made in respect to sails in an interview we did with Rob and Bruce of Ullman Sails Sydney during our YouTube video Ep. 20. 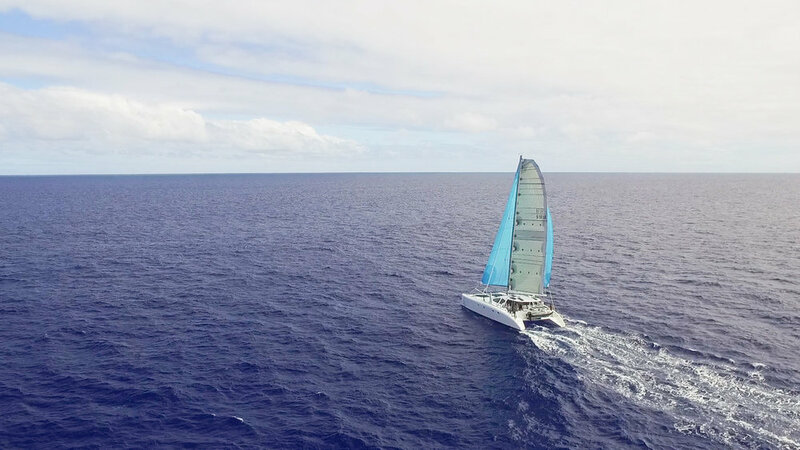 Going forward we will keep telling the story of ROAM and the gear we use including how these modern higher tech sails perform and last in the offshore cruising environment over their life cycle. Now with 5,000NM on the mainsail after the failure we feel we can document the whole story to date. Share our little mishap and what happened next. I hope and encourage others continue to tell the story of their sailing boats and travels as well. This way we can all share the experiences and the best product decisions we can. The hope is we take offshore sailing the best gear that will last and keep us out there! 29th December 2017. Approx 1900hrs. Location 6Nm NW of Cape Brett, New Zealand. We were running in approx 18-20 kts TWS on a Port Broad Reach with 1 Reef in the main on our way out of the Bay of Islands. We put in a gybe to line us up to pass well outside of Cape Brett. Liss was hand steering and I was on the main traveller. As we gybed, as soon as the battens popped through the sail failed directly above batten #5 between Reef 2 and Reef 3. The failure occurred at the leech and ran all the way to the luff progressively over approx 2 seconds. Liss observed the AWS to be 16kts immediately after the failure. The sail tore along the top of the batten as if tearing paper with a ruler. Loudly strand by strand. When I later checked the instruments the highest recorded TWS over the previous 2hrs of sailing was 22kts. We were about to commence an overnight sail 90NM down the coast from Bay of Islands to Barrier Island for New Years Eve. Forecast was for 16knots dropping to 11knots SW overnight. We elected for 1 reef as the forecast was trending down. Once we rounded Cape Brett the AWA would be well forward of the beam so if we found more breeze than forecast I intended to swap out to staysail and 1 reef main rather than 2 reef main and genoa as that would make us lee helmed upwind. We don’t roller reef the genoa if I can help it to look after the sail. The main depowers very well, if the AWA is less than 60 degrees, by easing the main down the traveller. When sailing 2 up, we try to make our manoeuvres as controlled and planned as possible. To break down the manoeuvre into a single task at a time we furl the genoa and gybe bare headed. For us this removes handling genoa sheets from the gybe its self and means we can furl the genoa in a controlled fashion, as we really try not to crease this sail. The draw back is the gybe is performed at lower boat speed and higher AWS but we believe we are conservative sailors and not ever in the margin where we would need to manage AWS down wind in order to keep from damaging gear. The main sheet is on the winch ready to dump (not clutched) if we get a round (we never have before). The traveller is in a crew members hand with 2 or 3 wraps on the winch. 1 is not enough to control the sails power and 3 is too much in light air and the sail can not be let down the traveller quickly. If sailing 2 up we hand steer through the gybe. If only one person on deck we use the pilot and the crew member manages the main traveller. In this case Liss was hand steering. 2 years old. 20,000NM on the boat. Approx 15,000NM on the main sail itself. No visual signs of deterioration. Shape Hold Excellent. As new. We have had to curb our NZ cruising plans due to the failure of the sail. Luckily our Genoa is fantastic so we can still sail quite effectively without a mainsail , even upwind at about 40% of TWS. But we canned any plans to circumnavigate NZ or even just the North Island. If repaired is it still reliable/How can we test the sail overall material condition? From some very basic inspection and tests along the split the film appears to be in good condition and not degraded and both the carbon and vectran strands do not appear degraded. Based on my description of the events did we do anything wrong? Could our gybing procedure be improved? After an initial email asking for close up, hi resolution photos of the damage Ullman conducted a review right up to their global technical lead. From there they came back to advise that they would effect professional and best practice repairs and carry out required service work on your mainsail in Sydney. We had not misused the sail. A replacement panel with Ullman Sails Cape Town would be designed and made. The new panel was made up and freighted from Cape Town to Sydney inside 3 weeks. The panel is approx 1m wide and full sail width. It also has the #5 batten pocket integrated. In parallel to the warranty work Ullman also wanted to service both our mainsail and genoa to give the sails a thorough examination to make sure that they will be able to perform reliably over the next period of its life. 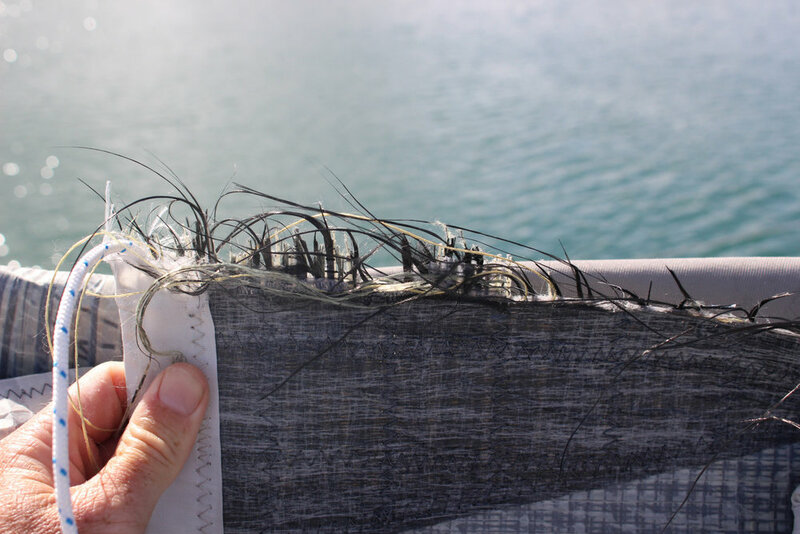 Ullman also stated that they believe the FiberPath Vectran / Carbon Double Taffeta is the right material for ROAM, stating the boats performance and appearance vindicate this up to this failure. We took ROAM to Auckland and found a marina berth of a couple of weeks. Apart from a customs or fuel dock it was the first time we had tied ROM up since we left Tasmania almost a year before. We stripped the sail, removed the battens and packed it for freight back to Sydney. It was sent back in 2 packages of almost exactly 30kg each. Liss and I rented a van for a couple of weeks to get a little time off the boat and check out more of the North Island taking our surfboards and mountain bikes with us for Rotorua and Raglan! The Genoa we kept for another month so we could keep cruising the North Island and we hand carried back to Australia when we flew home for a work trip as it weighs less than 30kg. Under reinforced bending, folding damage at the hinge points that form at the batten pockets. Caused by the sail folding as it is raised and lowered, and that break the primary yarns if not properly dealt with in build. The main got a new panel in, also Ullman reinforced every batten and seam with kevlar and dacron and also overlapped new two ply leech as further reinforcement to strengthen this area for future use. Ullman identified a few wear spots and ways of reducing specific and repeated hinging, mainly down the bottom of the sail, where it flakes, on the edge of the batten pockets. The two ply leech was added as a way of putting extra material in the batten end, and also covering all the other joins along the leech, and spreading the load into the sail. After having a good look over the sail they said, its in reasonable condition, it has a bit of UV damage as you’d expect. But overall once repaired we will be able to sail with (care!) and confidence. Ullman Sails tested part of the sail at the damaged area and found that the primary yarns had not degraded significantly in the sails life to date. First off we are lucky. The failure happened within a couple of miles off shore and we are in a country where we can easily find a solution. Freight although still a long drawn out process was taken care of without being hit with import taxes etc. The process still took over 3 months all up so we were also lucky it occurred at the start of the season, it did not hold us up sailing for our next season in the tropics. Initially I though there is no way the sail could be completely repaired with like for like material and keep its shape. I thought the membrane type sail choice had been a failure and I was devastated and very worried about the financial impact. When we received the email that the repair would be warranty work was a huge relief. 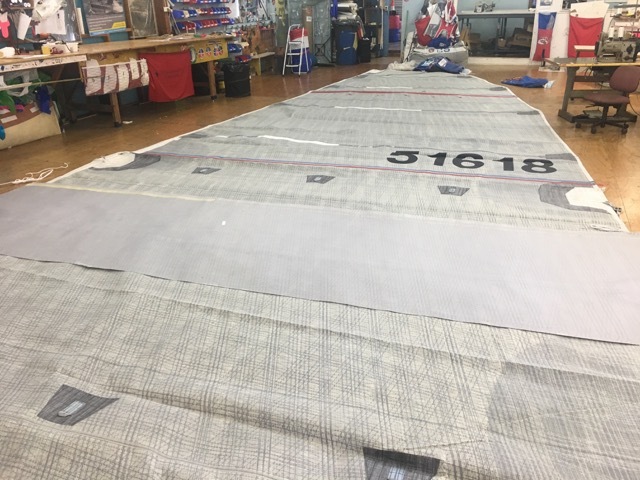 Ullman make their FiberPath sails in large cross cut style sections so the design and manufacturing systems are set up to build sails from panels and align fibers. We now have another season of sailing and another 5,000NM on the sail so all up we have 25,000NM on the boat. It’s as it was. Beautiful shape. No further issues to report. Its amazing how well the fibers in the replacement panel line up with the existing parts. I’m in the process of putting together a video I’ll post on YouTube to show all our sails and their condition after 25,000NM and 3 years of sailing. I’d like to say a big thank to Bruce and Ullman Sails for standing by their products and taking care of us as one of their customers. Overall, I have still really enjoyed the process of purchasing and owning these sails. I’ve learnt a lot and continue to do so. Being able to visit the loft and see what goes into building and maintaining the sails has been awesome. They make ROAM is great fun to sail. I continue ask around about how many miles others got out of their hydranet type crusiing sails and 40,000NM seems to be a common answer (or 1 circumnavigation etc) but sounds like quite alot of shape loss well before that. The cost comparison compared to our FiberPath sails seems to depend on who makes them and where. For some it sounds like hydranet was a cheaper option. When we priced hydranet (Australian made) it was quite a bit more than the FiberPath option we settled on. Did we make the right choice? Only time will tell. Ill let you know! The offshore cruising environment can be tough on gear and quality almost always counts. Older PostSat Phones, Offshore Comm's and the Iridium GO!